This Black Creek Pioneer Village wedding day was fast paced and fun. While the adults take their role very seriously, the kids live in a different world. For them, every wedding is an opportunity to meet friends, have fun, relax and enjoy the big day. For a Toronto wedding photographer, this is the best occasion for candid photography besides my favourite, the dance floor. In this image, we can see the family cat trying to cross the room. In the back, the guests are running around preparing for the wedding ceremony or getting ready to head to the venue to arrange the decorations. The bride adorned the banquet hal with plenty of DYI decorations and flowers picked that day from the gardens. 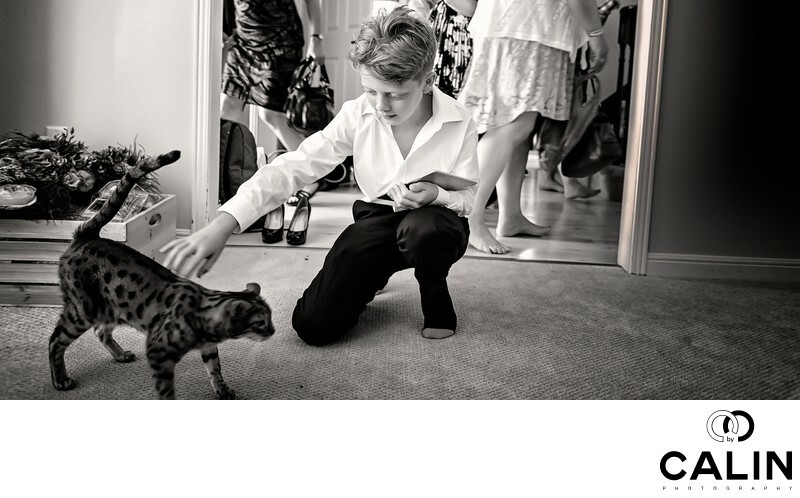 While the guests and the couple were busy with preparations, the bride and grooms' son caught the cat and started petting it. He does not seem bothered by the fast paced events unfolding around him and his taking his time to enjoy his parents' big day. So simple! In this shot, the cat and the boy enjoy each other's company oblivious to everyone else. Although it was a few months ago, I remember this scene like it was yesterday. The bride came late from the hair salon, and that affected the timeline. As a wedding photographer, I strive to keep calm in this kind of situations so I can focus. It is in these moments that one can capture the real atmosphere of the wedding and tell the story of the special day. While the guests and bridal party running around preparing for the wedding ceremony and the reception, instead of following them, I focused on the boy. He did not care there was a camera pointed at him and carried on petting the cat. After a few seconds, I took this frame. The couple loved it and included it in their album. After all, family photos taken on the wedding day are way more important than images of the venue or the various buildings. Wedding photography is about documenting the big day and not about pretty pictures of gardens, various locations or the banquet hall. While this was a splendid rustic wedding, on the wedding day the bride and groom chose to focus on people rather than places, decor or buildings. 30 years down the road to the bride and groom will be looking back happy to see their guests and relatives and relive their beautiful wedding day. That is the reason why during the wedding reception I love being on the dance floor so I can immortalize the people enjoying the party. And that is why I love wedding photography!